Imagine this happening, you are standing in a big beautiful meadow field and are surrounded by a herd of gentle grazing horses. The birds are singing, the wind is softly flowing, and you realize you are in a different world. One of them is attracted to you and walks slowly up to greet you; he places his soft muzzle into your open hand and asks you, “Will you be my friend?” You immediately feel a strong connection that is forming and want to get to know more about this creature that is pulling you in. This is what my clients experience when they enter into a horse’s world. It is a magical place where the shields are lowered and your child like curiosity emerges, no agenda, no strings, just pure bliss. After clients leave, they wish they could come back. And many do. Clients also may experience a reflective equine coaching session in an enclosed round pen. Inside this container the horse by nature, wants you to be your true-self. This means no masks, no hiding, and no lies. As you learn how to respond to this request you will start to focus on your dormant voice within, the truth, which provides a great opportunity for you to look at old patterns and limiting beliefs that are holding you back from living a life you really want. Horses are master healers and teachers that help you release old stories from the past and reconnect you to your inner path for the future. By nature they are highly sensitive, have super sensitive perception, and respond to your body language, muscle tension, heart rate, blood pressure, and more than anything your energetic flow. Because of this you get results in a shorter period of time. 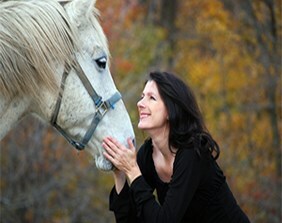 What Can Equine Assisted Coaching Do For You? Creates the breakthroughs, information you are not aware of that shows up from a subconscious level. 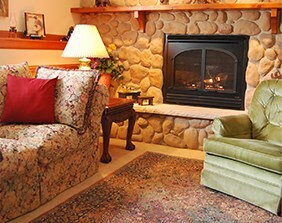 Provides a natural state which opens the door for you to relax and gain clarity about what you really want. Naturally engages your five senses of touch, sight, taste, hearing, smell and a sixth sense of an energetic feel, which helps you find the answers you are looking for. Teaches you how to trust yourself and your intuition. Provides a temporary break from internal turmoil which helps clear the mind allowing for inspiration to flow in. * If you are not feeling comfortable through coaching with a horse and fear is getting in the way, all horse communication takes place safely from the ground; no riding involved and no horse experience is needed. Pre-work questionnaire; to help meet your goals/objectives prior to the intensive. We were in a round pen and Pam asked me to use my body and energy to lunge Dan (one of her horses). I wanted to use a halter or say something, but was not able to; I had only my body and my energy to work with causing me to rely on my creativity. I finally projected all my thoughts toward him, “DAN MOVE FORWARD”, and he finally did, at a walk, reluctantly. I was not comfortable; I could NOT get this horse to do what I wanted with just my body, my energy. This is NOT what I expected, it should have been easy for me, I wanted to use the props! 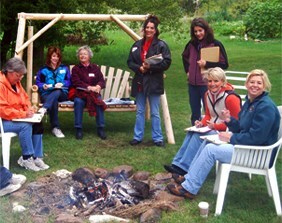 Whether you are a Horse Lover, Healer, Coach or Therapist this is a unique program that teaches the skills that are needed for Equine-Assisted Coaching. Adding this in demand modality will help you to help your clients move into expressing more freedom and joy – creating a life they really want. You have a calling to partner with horses to help others find their way? You have a passion for helping to promote empowerment and positive emotional well-being in others through coaching with horses? You are looking for more purpose and joy in your life? You are drawn to animals, nature, or creativity? You are looking for training tools, a proven step by step system and experience? Even if you’ve accomplished a great deal in your life, you need something more to satisfy your soul. You will learn the skill set, and the necessary tools to become an effective facilitator of Equine Assisted Coaching and have the skill set to begin offering Equine Assisted Coaching to your clientele. Contact us for information and additional details. 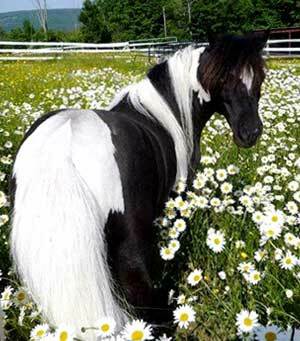 The image of a Pinto was by Sandy Croote. Used with permission. 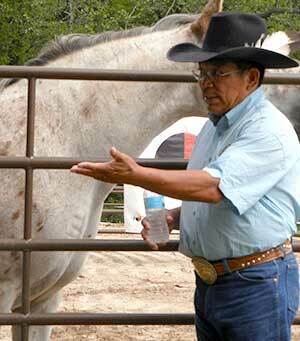 I had the great privilege of learning firsthand from Native American Horse Whisperer Phillip Whiteman Jr. (pictured above). Phillip is a cultural consultant, international presenter, nationally renowned horseman, and gifted teacher. He was featured on ABC’s Primetime Live with Diane Sawyer. Phillip developed and teaches the Medicine Wheel Model, Natural Horsemanship; and a holistic circular model that interprets the true language of the horse.